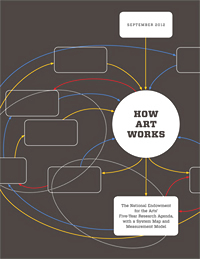 For any who missed the live webstream of our American University public forum on How Art Works, the new report and system map from the National Endowment for the Arts, fear not. The entire event is now available in lovely little video segments online. The public forum was an opportunity to learn about and explore a system perspective on how arts expression and experience impacts individuals, communities, and society. Featured speakers included lead consultant Tony Seisfeld from the Monitor Institute, Rocco Landesman of the NEA, and Sunil Iyengar, the NEA’s Director of Research and Analysis. Also on hand were two fantastic panels of practitioners, academics, and artists to respond to and reflect upon the map and its implications. Make some popcorn. Put on your “I [heart] cultural policy” pajamas. And enjoy the show!